Somewhere in Armenia at any time of the workweek, educators are learning up-to-the-minute teaching methodologies and approaches and, simultaneously, are mastering Junior Achievement of Armenia's (JAA) economics and civics curricula. JAA operates 56 training sites throughout Armenia. Training includes several hours per week of classroom instruction, as well as educational field trips and private meetings with prominent local and national leaders. JAA's eight regional representatives and their local staff organize the training and serve as site monitors. Each year, JAA organizes weekend training seminars in the pristine mountainous regions of Lousakert and Dzaghkadzor. The seminars bring together experienced JAA instructors and teachers-in-training to learn the latest approaches to teaching. The seminar instructors have been trained in the United States offer lessons in cooperative learning, brain-based education, multiple intelligence, and Bloom's taxonomy. Important topics of discussion include critical thinking, communication building, classroom management, concept development, and cooperative projects. The seminars feature lectures, role playing, instructional games, small group discussions, hands-on projects, and lesson plan presentations. Distinguished guests from Armenia's public and private sectors are invited to speak on relevant topics. Over the past four years, more than 3,000 Armenian educators have participated in JAA's weekend training seminars. Junior Achievement of Armenia (JAA) is at the forefront of civic education in the Republic of Armenia. Among the many exceptional extracurricular opportunities we offer is a teacher training program in the United States. Since 1998, JAA has brought over 70 civics educators to Washington, D.C. and California to undergo a four weeks of intensive civics training. This unique experience is funded by the U.S. Agency for International Development. 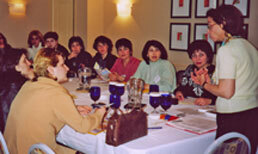 In 2004, we welcomed fourteen JAA instructors to the United States. They first traveled to Washington, D.C. where they met prominent political leaders; observed the three branches of government in action; visited key U.S. government agencies and institutions; attended high school and college lectures; and met representatives of the national media, among many other engaging and relevant activities. After their stay in Washington, they spent nearly three weeks in Southern California experiencing intensive training. For example, they observed a variety of high school classes; met with American principals and teachers; attended cutting-edge training seminars; studied curriculum development; met with academicians; met state and local political and judicial officials; visited local media outlets; attended city council, Chamber of Commerce, and Rotary meetings; visited social service groups; and met law enforcement officials. Following this extraordinary month-long experience, they returned home to train their colleagues in the implementation of civics education. JAA has operated this highly successful program for five years – in 1998, 1999, 2000, 2003, 2004 and 2005.